Abcmd.exe can copy disc to iso file or bin / cue file from command line. It will perform a sector-by-sector copying. All sectors in source disc will be copied to the image file. If the destination file is bin file, a corresponding cue file will also be created to describe the disc track format. -o: Specify output file name. -ot <iso | bin>: Specify output file type. If not specified, the file type will be determined by file name suffix. 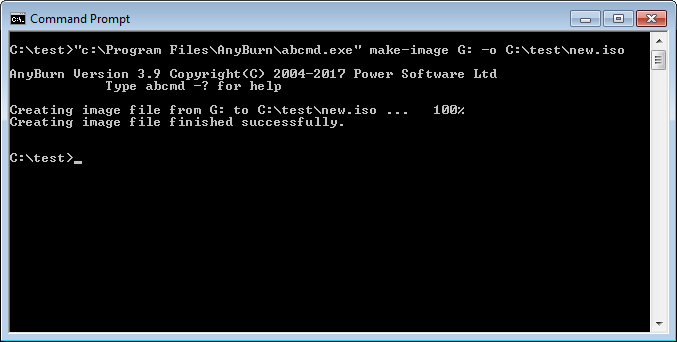 Example: Copy disc in drive G: to iso file, and save the ISO file to C:\test\new.iso. Example: Copy disc in drive G: to bin file, and save the bin file to c:\test\new.bin.